I am the lucky recipient of an 8 x 12 C&P New Style press (SN B53538). It came with a motor that is detached and looking pretty rusty. No belt in sight. How can I find out where the motor mounts and what belt to get? I am attaching some (not so great) pictures that may or may not help in the discussion. Is it possible to retrofit this press with a pedal? 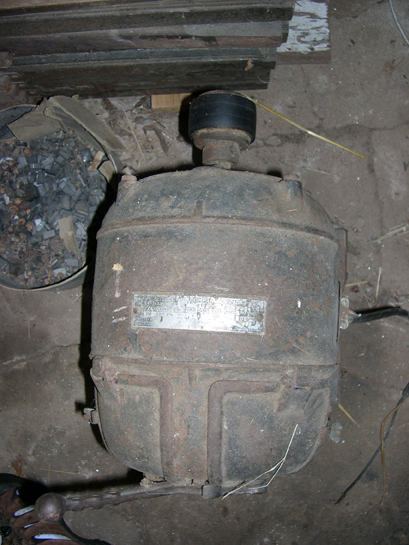 It appears to be a variable speed motor, the lever on the end controling the speed. It looks like a later model with ball bearings. The outside may be dirty and rusty but the inside may be fine. The only way to know if it needs to be cleaned or refurbished is to take it apart. This is not difficult but if you haven’t done it before you may want to take it to a local electric motor repair shop and have them look it over, check the bearings, etc. In the end it might cost $75 to $100 to have it refurbished, if it needs to be, but this would be well worth it. AT the very least they could replace the wire and include a plug and a switch in a box that you could mount under your delivery board. The motor has a rubber-faced pulley which is used in direct contact with the face of the flywheel to run the press. This was one standard method used in place of a belt. You need to bolt the stand the motor is on either to the floor, or to some wooden runners bolted cross-wise to the wooden runners that are under the press. You may have to replace these if they’re not long enough. Set everything up so there is some adjustment available so you can move the motor so the pulley will be in proper contact with the flywheel. Thanks for the great response. Bear with me now, do you mean that the motor will then be mounted to the right side of the press with the rubber pulley aligned with the rod that is sticking out the side?? While not pictured, I think we all assume that the press has a large wheel on its left side. That is the flywheel. The motor could be positioned on the side adjacent to the flywheel and, if the surface of the device on the motor shaft is indeed rubber, positioned so that that surface runs against the flywheel, causing it to turn. The lever which protrudes from the rear of the motor is a speed control. If the flywheel is missing, you’ll have to find a replacement for it. 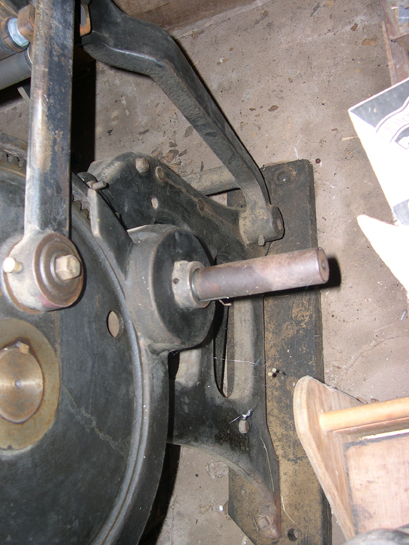 If the surface of the piece attached to the motor shaft is hard, not rubber, it is a flat pulley which is indented to drive the press with a flat belt which can be run against the large flywheel or a pulley (now missing) on the right side of the press. There is no pulley on the right side of the press because in this case the drive system is set up to turn the flywheel on the left side of the press directly from the motor using the small rubber-covered pulley. Therefore, the motor needs to be mounted and aligned so the face of that pulley is directly against the flat face of the flywheel. Just to be clear: the flywheel is the large wheel attached, or that should be attached, to the left side of the press on the main drive shaft. It’s probably about 30” or so in diameter. The shaft sticking out on the right side of the press should just be left as it is. Originally there would have been a pulley there, which is why it is sticking out so far, and the press driven from that side. But the setup you have is perfectly legitimate and in fact C&P offered a specially milled flywheel for just that purpose. It was ground especially true and flat on its face. 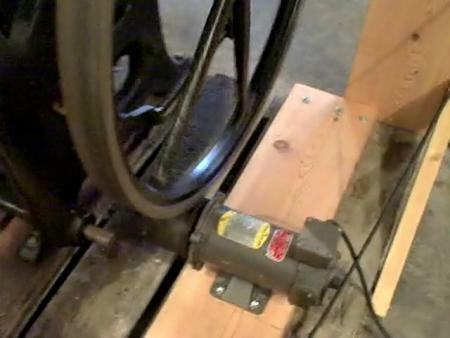 However, a standard flywheel will work as well which I’m guessing is what you have. BTW: jhenry made a good point. I am assuming the small motor pulley is rubber covered because from the photo it looks like it is and because it is obvious no drive pulley has been mounted to the right side of the press in a long time. But if in fact that pulley is not rubber covered, or if it is but is too old and dried out/hard, you will either need to have it recoved, replaced, or set up a standard drive with a pulley on the right. But don’t get excited or confused, I’m betting it is rubber. Do you think I should attach a plug to the wires and just “see” if it turns? Or go straight to a shop and have the motor looked at? And will it run on a regular 110 outlet? Indeed the pulley is rubber coated and the flywheel in definitely in place on the left side! I am feeling closer to success than ever now! The variable speed lever, seems a bit “out of the way” to control while the press will be running, but maybe not? Thanks to you both for such great information! But while handy, it is not essential if you plan on running the press at a single speed all the time which is what most people do. You could always rig something similar up out of wood/metal. If it were me I’d check out the existing wiring on the motor and hook up a plug and check the motor out myself. BUT, that is only because I’ve restored dozens of motors and machines over the years. Otherwise I’d take it to a shop. That would be the safest and most effective way of checking it out. Even if work needs to be done it should not cost much and be well worth it. Of course, there is the slim chance that the windings are burned out and the motor cannot practically be repaired. But chances are it is fine or may only need minor work. There should be a metal tag/plate on the outside of the motor that will give the horsepower, voltage, amps, phase, speed range, etc. and may even have a wiring diagram for 110 and 220. However, that tag is sometimes missing. It probably runs on 110 but the man at the motor shop can tell you for sure. Keep moving forward; you’re heading in the right direction and will get there. If you are looking for a belt, Autozone has a 122” belt, nearly one inch wide. 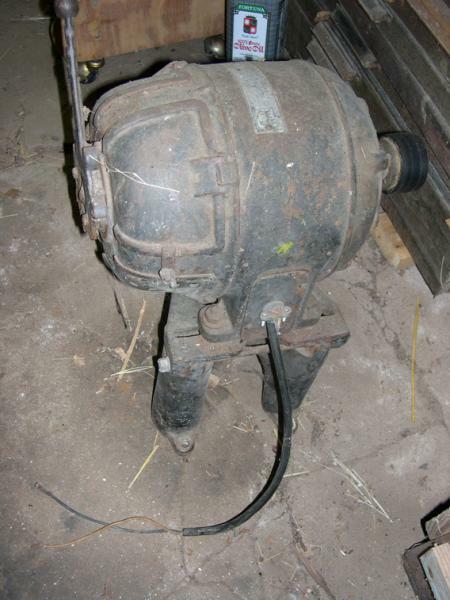 We just purchased one for a 12x18 we’re resurrecting, running it directly from the motor shaft without pulley. I think it was less than 45 bucks. Well, here I am, almost a year later and still haven’t made any progress getting my press going but I have hope! It seems to have the ability to swivel and am wondering what the best way to mount it is. I had so much trouble finding images of how the motor with a flat faced pulley was positioned, but I finally got it figured out. I have a video of it here http://www.youtube.com/watch?v=_Wkyo8U4qH8. Also, the motor must be fastened to a stand that can slide it back and forth when the pulley wears down.